Introducing the next-generation 2019 Toyota RAV4! 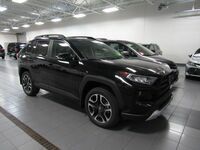 This sporty new crossover SUV has been fully redesigned for 2019 with a longer and wider body, an increase in ground clearance and a 57 percent increase in body rigidity. Under the hood is an updated 2.5-liter four-cylinder engine that sees a 15-percent increase in fuel efficiency. Likewise, the 2019 Toyota RAV4 Hybrid model also receives an updated setup under the hood. Talk of all these updates bring up a very important question. Just how does the 2019 Toyota RAV4 compare to the competition? Like the 2019 Toyota RAV4, the 2019 Honda CR-V also receives some updates for the model year. Just how different are the two SUVs and which is a better value? Here’s a closer look at how the two compare. 73.4 cu.ft. Cargo Space 75.8 cu.ft. While the 2019 Toyota RAV4 receives a full redesign, the 2019 Honda CR-V remains relatively the same for the model year. Not only that, but the 2019 Honda CR-V struggles to match the 2019 Toyota RAV4’s generous array of high-tech features. While the CR-V does boast slightly more cargo space, its cabin can’t compete with the 2019 Toyota RAV4’s premium materials and comfortable seats. 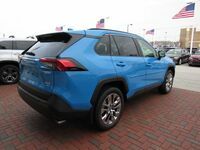 Unlike the 2019 Honda CR-V, the 2019 Toyota RAV4 is also available with a hybrid option. But don't take our word for it! We invite you experience the 2019 Toyota RAV4's impressive handling and performance firsthand. We expect this sleek new model to arrive in our showroom as early as winter 2018. Choose from a variety of sleek color options and trims! Contact our team for more information on the new 2019 Toyota RAV4, including details on how to reserve yours.